It is stating the obvious to say that the Mets look like a different team since the July 31st trade deadline. Of course, they are a different squad, after the additions of two ancillary pieces and a borderline superstar to their previously inept lineup. The roster is much deeper, which suddenly creates competition, and Terry Collins now has many more options with which to play. I worried that options might not necessarily be a good thing for Collins, whose moves often perplexed me, but the 10-3 record the Mets have posted in August has made me look foolish. Collins deserves credit, but the players deserve the lion’s share. They have all bought in. The two guys who figured to be squeezed the most after the trade deadline were Juan Lagares and Wilmer Flores. Flores has elevated his play this month, recording one clutch hit after another, one standing ovation after another and earning pretty consistent playing time either at second base or shortstop. Lagares’s fate has been more tenuous. He has played sparingly since the trade deadline, either getting a spot start versus lefties or coming in as a late game defensive replacement in center field. Lagares, an everyday player and Gold Glove winner a season ago, has not hung his head. “It’s a little hard, I can’t lie and say I don’t care, because you know, what you want is to play. But you can’t do anything about it. Come ready to play every day because you never know,” Lagares said in Spanish after a win over Colorado earlier this week. There is, perhaps, no better example of, or to, these current Mets than Michael Cuddyer. Strange, I know, since he’s widely been considered a huge disappointment on the field in his first year in Queens. After inking a 2-year, $21 million contract in the off season, Cuddyer is batting .250 with 8 home runs and 31 RBIs, while suffering through a knee injury that forced him into a DL stint before being reactivated on Monday. But, upon his return and after realizing that much – including his potential playing time – had changed, Cuddyer’s leadership and attitude has remained a positive. “There are pros, guys who appreciate the game, that do the things that I think you're supposed to do…in the clubhouse, on the field. Michael Cuddyer fits that category,” Collins said Tuesday night. Cuddyer sang much the same tune this week while the Mets were sweeping the Rockies. 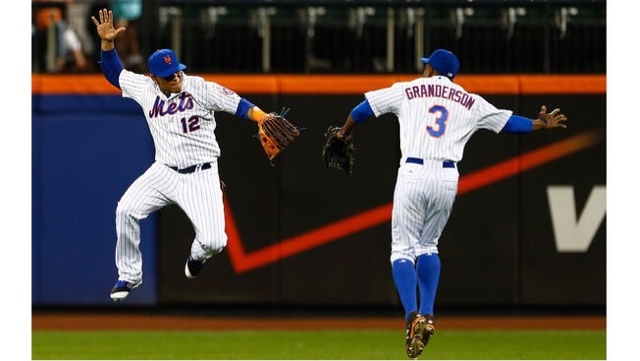 Juan Lagares and Curtis Granderson rejoice after a win over the Colorado Rockies. 10-3 in August is fun for everyone. The only question for fans is whether this fun has legs that can carry the Mets through September and into October. Juan Uribe, who has been a part of two championship teams, also stuck with the fun theme when asked if this team reminded him of a winner. Whether he realizes it or not, Uribe has played a big part in that attitude in the small amount of time he's been here. Since the trade deadline it seems everyone has bought in. They realize that this is their team and if everyone plays their role the team will be successful; and with success comes fun. Mets fans can surely attest to that.